WONDERLAND IS SORRY TO ANNOUNCE THAT AT THIS TIME (MARCH 2018), WONDERLAND IS CLOSED TO ANY INCOMING ANIMALS (RABBITS, CHINCHILLAS, GUINEA PIGS, ANY ANIMALS). UNTIL WE CAN GET ANIMALS ADOPTED INTO NEW HOMES WE ARE COMPLETELY FULL AND FUNCTIONING ON A SHOESTRING. WE APPRECIATE YOUR UNDERSTANDING AND PLEASE DO NOT CALL US TO SURRENDER YOUR ANIMAL OR ABOUT SEEING A DOMESTIC RABBIT RUNNING WILD. WE CANNOT HELP AT THIS TIME. HERE ARE THE OTHER RESCUES IN THE SE MICHIGAN AREA: INFORMATION FOR HELPING WILD BUNNIES CAN BE FOUND AT THE DNR'S WEBSITE. WONDERLAND IS NOT LEGALLY ABLE TO ASSIST WITH WILD RABBITS EITHER. IF YOU FIND A NEST THAT HAS BEEN DISTURBED YOU CAN FIND HELP ON THE MICHIGAN DNR WEBSITE. YOUR ABSOLUTE BEST BET IS TO PUT THE BABY BACK IN THE NEST WHERE YOU FOUND IT. MOTHER BUNNY ONLY COMES AT DAWN AND DUSK TO FEED. RARELY ARE THE BABIES ACTUALLY ORPHANED. IF YOU ARE POSITIVE THE BABY IS ORPHANED, PLEASE SEARCH THE INTERNET FOR DNR REHABILITATORS IN YOUR STATE (THERE IS A LIST BY STATE AND COUNTY ON THE DNR'S WEB PAGE). THANK YOU. 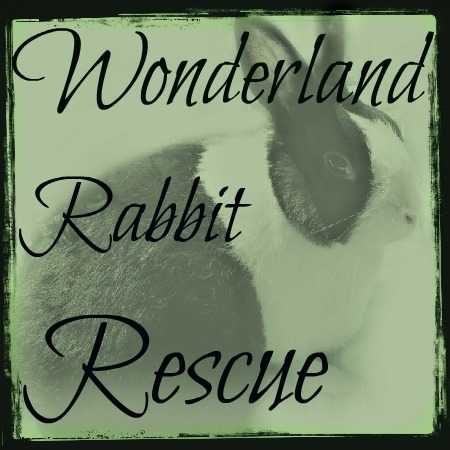 If you are intrested in adopting a rabbit, PLEASE copy the adoption form (on the left uner Adoption and other Forms) into an email or word document and send it to wonderlandrr@gmail.com. You can also call us Mon-Sat 10a - 4p. If we do not answer please leave a voice mail and we will return your call. We spend lots of time with the buns, so we may miss your call but will return it as soon as possible. (313) 383-5615.